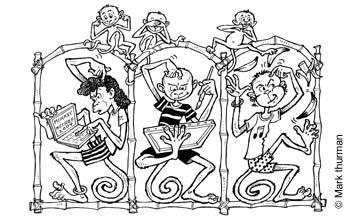 I don’t know if those little monkeys are scratching their heads over how to write a mystery novel or not – but that’s what I’m going to be speaking about at the October meeting of the Canadian Society of Children’s Authors Illustrators and Performers (CANSCAIP). It’s happening on Wednesday, October 13 at 7:30 at the Northern District Library, second floor. Hope to see you at the little red dot below. We expect a large turnout. I know I’m looking forward to learning all Vicki’s writing secrets. Waaahhhh! How did I miss this?? Did you have fun? Well, I really hope we will see each other for the Tree Awards. Congrats again!